Due to the current trend of late marriage for women in Taiwan, age has become the most important cause of infertility in Taiwan. As women become older, the numbers of oocytes steadily drop and oocyte quality declines. To this day, no medication or injections have proven successful in stopping this natural process of oocyte aging. The importance of age’s role of increase in chance of chromosomal abnormality cannot be underestimated. Can you guess for a 42-year-old woman how many eggs out of ten actually have normal chromosome? The answer is two. According to studies, 40 or older women have almost 70% chance of possessing oocyte abnormality. Most women approaching advanced maternal age still don’t have plans on becoming pregnant yet, but they still wish to have their own children. Therefore, choosing egg freezing, or cryopreservation, has become increasingly popular in Taiwan. 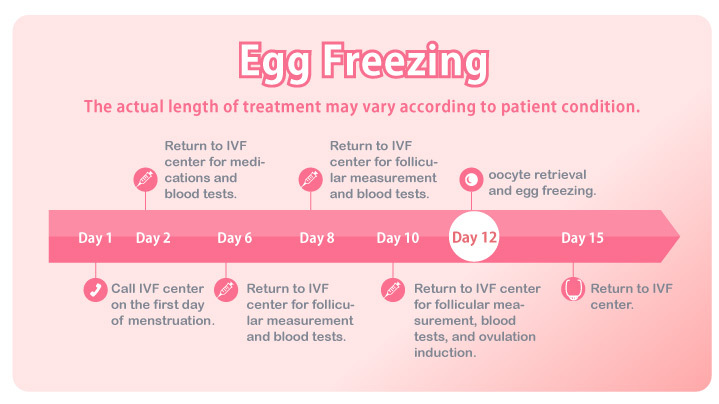 Because long term storage of frozen eggs does not result in any decrease in quality, it can be seen as an asset and help women decide when their right time for pregnancy and motherhood is. Who needs to freeze their eggs? When freezing oocytes, the number of eggs retrieved from each woman is different and depends on age and individual response to drugs that stimulate ovulation. Basically, the younger the patient and the higher the level of anti-mullerian hormone, the more the number of eggs preserved. On average, usually 10-20 oocytes can be retrieved from 35 and younger women at one time, while only 5 oocytes can be preserved for women older than 40 due to ovarian decline in function. Multiple times of egg retrieval is of course an option to store more oocyte for future use. Younger women have the advantage in higher success of pregnancy due to better condition of their ovaries. They also need less medication and time for the cryopreservation process so it will cost less. Therefore when choosing to freeze your eggs, the younger you are, the better. What are the effects of fertility drugs on the ovary? Fertility medications are agents that stimulate the development of follicles (immature eggs) in the ovary. Women are born with all the eggs they will ever have, around 4 million, and fertility drugs or injections will not hasten menopause. When puberty begins, 7 to 10 immature eggs are prepared for release every week. However, only one egg will prove to be dominant and is released for ovulation. All the other eggs will shrink and slowly die. Fertility medications boost the hormones for those other eggs to actually grow and become mature too. No extra oocytes are taken so there is no need to worry about premature menopause.